and hundreds, maybe thousands of dollars in savings over the long term thanks to smarter grocery shopping habits. You are also helping the planet because you will be wasting much fewer food. The single most important thing about a pantry challenge is to conduct a thorough inventory of what you already have in your fridge, freezer, and pantry. Think of it as a decluttering exercise. Keep nothing in your kitchen that you don’t know for sure to be edible (items way past their due date or otherwise wasted have to go), tasty (get rid of condiments you tried once and will never eat again) or nutritious (toss junk food or make a plan to eat it soon if you can’t afford the loss). and repeat until every item has been examined and registered. and only then put everything back in carefully. Pro tip: Wear thin gloves when it’s time to do this in the freezer. Clean gardening gloves are awesome for this purpose. 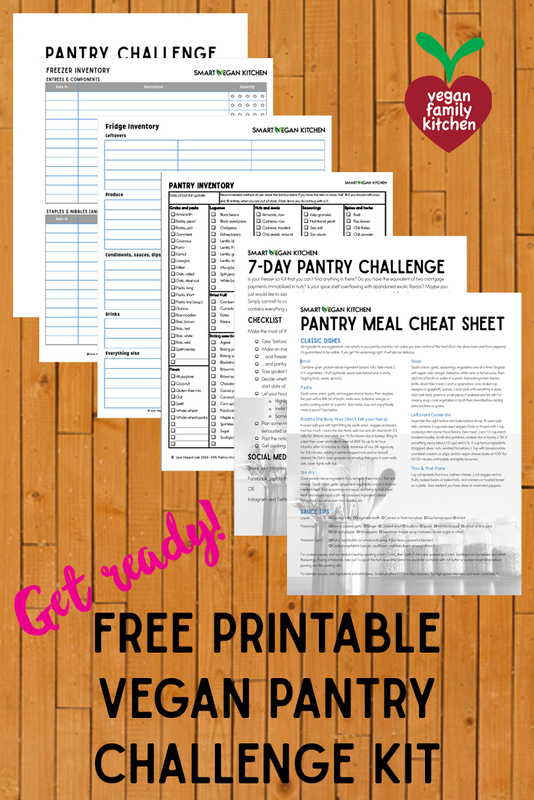 To make the task easier, you can print my inventory templates that are part of the Vegan Pantry Challenge kit (download instructions at the bottom of this post). Check your small appliances and kitchen tools, too. First, you may have some that are not even working anymore. Dispose of them responsibly. Next, ask yourself some hard questions: if you have not used the bread maker in the last three years, why keep it? If you decide to make bread again on a regular basis, trust me you won’t have a hard time buying another bread maker off Craigslist. Make space! If you are not ready to let a specific piece of equipment go, give it a 6-month notice and mark your calendar. If you haven’t used it by a certain date, let someone else who needs it more have it. On the other hand, getting back in touch with the tools you have invested in can guide your meal planning routine. If you have a spiralizer, challenge yourself to using it every day for a week once in a while. Just for that week, you can leave it out on the countertop for convenience. You’ll be fueling up on lots of veggies, for sure! Commit to pulling out the food processor once per month to make a triple batch of hummus or veggie burgers (both freeze well). 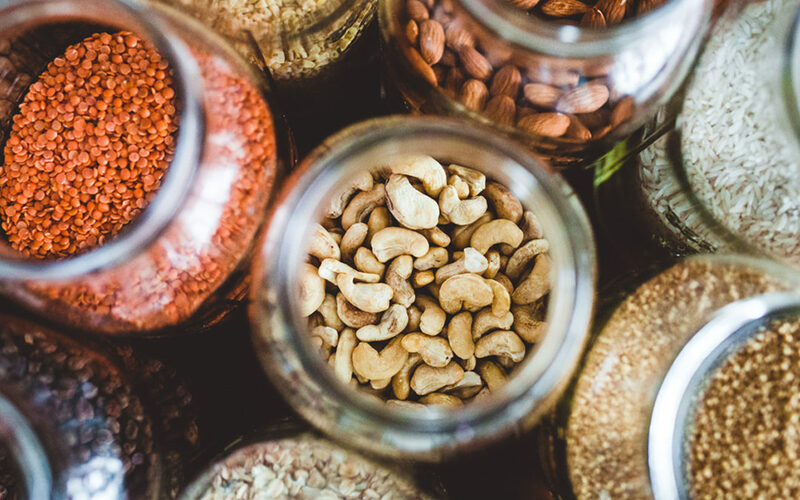 You need only two elements to get started in your meal planning for a vegan pantry challenge: a feature ingredient, and a mode of preparation. As you crafted your inventory, you probably encountered many ingredients you had forgotten about, or have been shy to use without a recipe. Pick one as the cornerstone of your meal. Whether it’s a fancy condiment, an overstocked spice, a special bean you bought from a local farmer, or some dried mushrooms or fruit or whatnot, just choose one. You can also start from some fresh produce. Then, get creative with the preparation. No need to invent new types of food entirely! Think of it like jazz music: there are many standard tunes or series of chords that belong to the common repertoire. Individual musicians will improvise upon them, yet listeners will still recognize them. In the realm of food, we have stir-frys, pot pies and casseroles, pasta dishes and jambalayas, along with their risotto and paella cousins, soups and stews of all origins, and so on. You have known many of those from childhood, and discovered others through forays into exotic cuisine cookbooks, and even simply by eating them at restaurants. Pair your feature ingredient with a standard mode of preparation that inspires you, then jot down a few other ingredients you have at hand that could make a worthy contribution to the meal. Add some basic notes about how to go about preparing it all. I don’t recommend using a recipe at this stage because it will most likely trigger you to go buy other ingredients at the store. Repeat this process a few times and you will have a complete meal plan for the coming week, using only what you have already. Also think about drawing down your frozen inventory, starting with whatever is oldest. If you have some frozen soup, it’s a great way to round up a meal. Frozen veggies will make a great addition to almost any rice dish. If you have frozen fruit that is more than a couple of months old, it’s probably a great idea to make smoothies with it sooner than later. How long to do it for? I recommend doing a pantry challenge for at least one week, with 10 to 14 days being ideal. if you have a huge stock of frozen food, you may need to dig a little deeper. Again, the goal is not to make it to the absolute bottom of every container in your pantry, but it’s a good idea to reduce the overstocked ingredients to manageable levels. Mindfulness is not just for yoga classes. It’s a great habit to have in the kitchen. Pay attention to the ingredients you are buying and then using. Watch yourself as you cook. Notice the result. It’s nice to snap a pic and share on Instagram, but the most important part is to really look at what you are doing and to carefully taste the food. If you like to write, consider keeping a food journal to jot down your experiments, what worked and what could have used a different approach. If you get in the habit of being truly mindful in the kitchen, you might not have to do a pantry challenge too often.